It’s always been on my bucket list going to the middle east, especially Israel. Despite all the long and still on-going conflicts, wars, even terrorism, somehow I just really want to go there. That bucket list of mine finally comes to reality in July 2015. Although it’s been a year since I went there , I’m still excited to share the story of my trip visiting Israel, Palestine, and Jordan. I will try to give the best of my personal story, how I felt, and all the surreal experiences being in the Promised Land. sorry for being so late, busy with things, plus we started blogging just recently.. This is a pilgrim trip. So yeah, it is a “spiritual journey” (a.k.a. Holyland Tour) and yes, of course, I went with a group tour (about 30 persons of church members) that was arranged by a tour company based in Indonesia named Sharon Tour together with the local tour operator in Israel GEMM Travel. Therefore because it was a pilgrim, the itinerary was set to places where there’s a story happened in connection with Christianity. So mind the Christian’s perspective. Because we had things done by the tour company, such as booking for hotels and restaurants, so I don’t have the details about their prices and any other information details, since I don’t have enough time to cover that all while being there. Why? I have to do the video shoot for the documentation purposes for the church, plus doing some shoot for monthly Pastor Message also. In general, I paid for the tour US $2,585 and brought $1,150 for personal expenses. I spent only half of the cash I brought with me. All the photos that I will share in this and the couple next posts are all post-processed to suit the best of what I want to share about how I felt when I was there. Some taken with the camera, some only with a smartphone. Hopefully, it’s good enough to inspire. Israel is known worldwide as a small but very influential nation in the world. Home to roughly 8.5 million people which the majority of the population is Jewish (about 75%) and the second largest population Arabs (about 20%). The rest are a mixed of immigrants from many countries. Their main language spoken are Hebrew and Arabic. The currency used both USD and Shekel. The trip started on July 15, which is a holiday season in Indonesia. So, the airport seems very busy that afternoon. 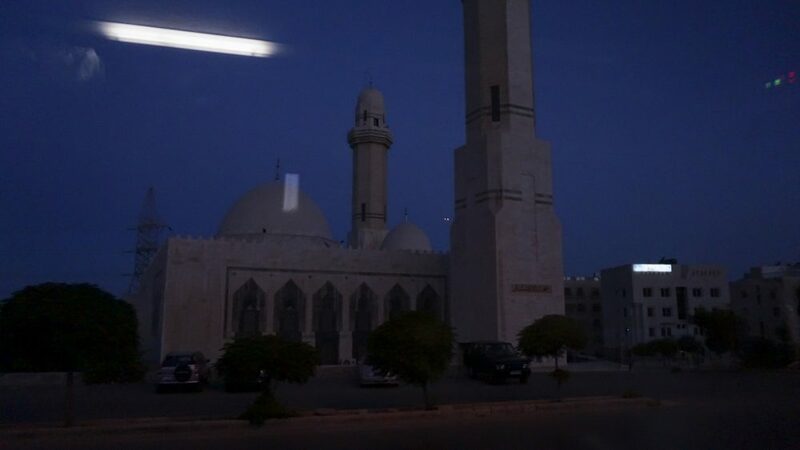 We flew with Etihad from Jakarta to Amman, Jordan with one transit in Abu Dhabi. It took us approximately a total of 11 hours of flight. My seat is in the alley, so no window for me this time but thank God I had this empty seats next to me, more space for me and my buddy at the window side. With this long haul flight, that extra space really makes a difference. I wonder does anybody really enjoy a long flight in economy class? I felt like I was in another time dimension. I’ve been sleeping and waking up many times, going to the toilet many times, even walking around the plane just to relieve my muscles. Long flights are painful. But the experience with Etihad was good, the food and the service are great, the staffs are world class. They all look beautiful, credit to those middle east genes. I just love to see those middle eastern faces. It’s the first time I saw an Arab Man doing a prayer on a plane. I guess it’s a common thing in flights to Arab Countries, the flight attendants seems very handy in helping passengers with that prayer thing, such as showing which direction to face to do their prayer. A lot of Arab people on the plane do a prayer on a long-haul flight because they do 5 times prayer a day. Landed in Abu Dhabi which is very late at night and we still have to wait about 2 hours before our connecting flight. We got a warning from the airport staff where we gather around the toilet right after we get off the plane. Since we’re going as a group we’re all waiting ’till the last person done, which was a problem because she said we are blocking people from their way to move. Either she’s just doing her job or just being annoying, because I saw more than enough space for people to pass. And this group of Indonesian people (read : us) which I kinda understand that not everybody is considerate enough for other people space. Proceed to the security check really upsets me seeing a lot of people still don’t know how to properly dressed and behave at the airport. Such a waste of time to queue like this every time. A couple hour waiting, about time to get on the bus to the plane before this one Arab guy makes a fight and yell at the staff just because a minor misunderstanding about the queue line which costs us more time. Again, my goodness… Maybe because it is very exhausting after more than 8 hours flight, very easy to annoy me with things like this. Geez… All I care about next was sleeping again on the plane to Amman. That’s it. Israel and Jordan are two neighboring countries in the middle east. 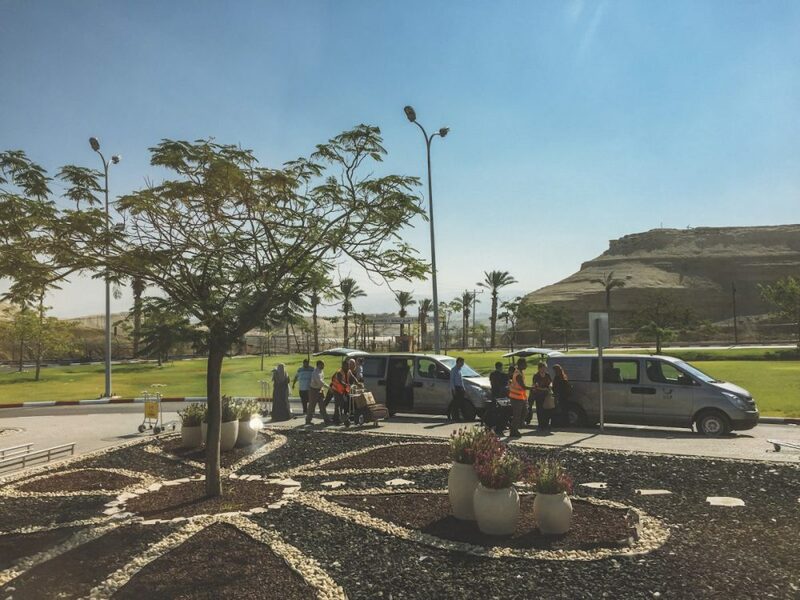 A lot of tour companies now prefer to access Israel through Jordan, because the flight is cheaper rather than fly straight to Tel – Aviv. 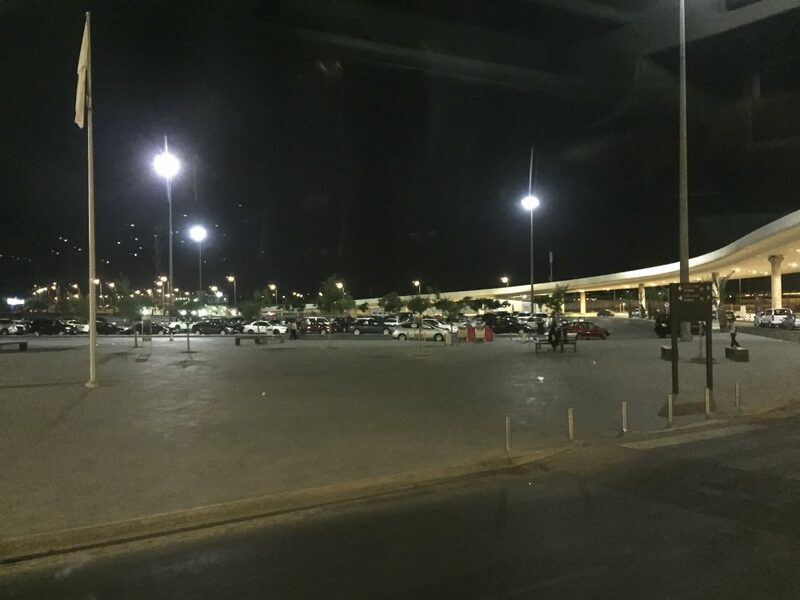 Landed in Queen Alia International Airport, Jordan’s new and largest airport. 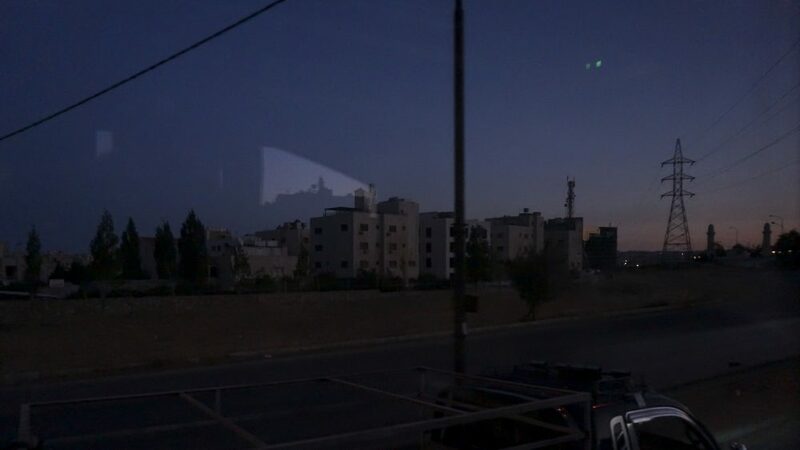 I can feel the cold temperature at dawn in Jordan, it can go low to 20 °C at night. As soon as we proceed to the immigration and baggage check out, we got this local guide to directly get us all on the bus to start the ride for our breakfast. Mr. Mahdi, our local Jordanian guide, took us directly to our first stop in Amman at Geneva Hotel for a breakfast and a short refreshment for those who wants to take a shower. 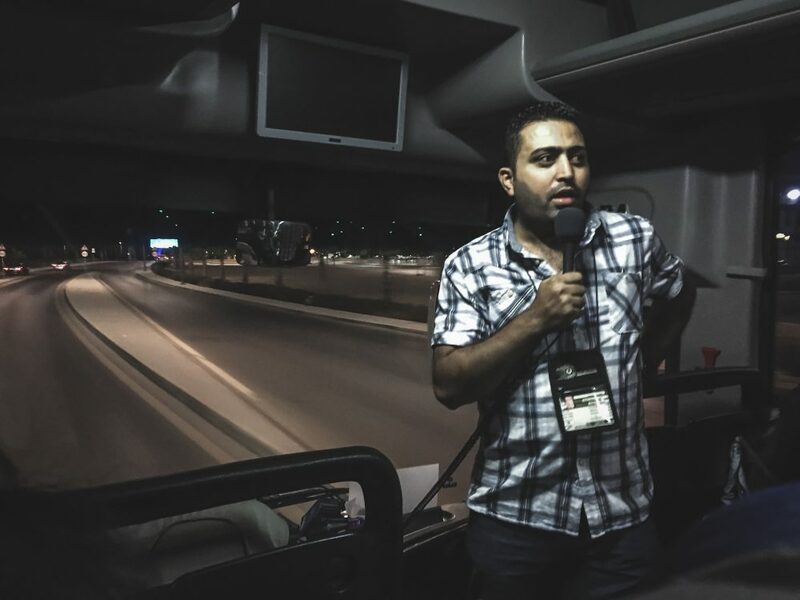 A short introduction about Jordan and Amman from Mr. Mahdi, plus a little bit of himself as an intermezzo. Turns out that he can speak Indonesian fluently because he’s been attending college at Yogyakarta, Central Java – Indonesia. That explains why. Half an hour drive, we arrived at the hotel. Immediately get to the restaurant for a buffet breakfast which is pretty good, I never really taste middle east food except for kebab. They have a lot of variety of food from the salad bar, desserts, cakes, to the main menu such as flavored rice, meats (lamb, beef, chicken), and of course lots of beans. Their salad was good, I like it. Some of us having breakfast while the other go for their morning routine, a shower and change clothes. Here I am downstairs at the restaurant preparing things for the video shoot. Checking the camera, battery, attach the lens, checking the lavalier mic which turns out that the battery ran out and I didn’t bring any backup, great! No matter how you try to be perfect, there’s always a flaw. Nevermind… Just use the iPhone. Time to hit the road, as you can see the sun already shine pretty high at 7 in the morning. And immediately I can feel the temperature rising. We’re going straight to cross the border to Israel. Because I’m going with a tour, then everything was taken care of. No hassle, just sit and wait. But if you’re going by yourself, then please read everything you need to know about crossing the border into Israel from Jordan. I found this article pretty helpful with the information. Or you can just visit the official site of the tourism ministry of Jordan and Israel for more updated information. And don’t forget to take care of your visa. There are three border crossings between Jordan and Israel. 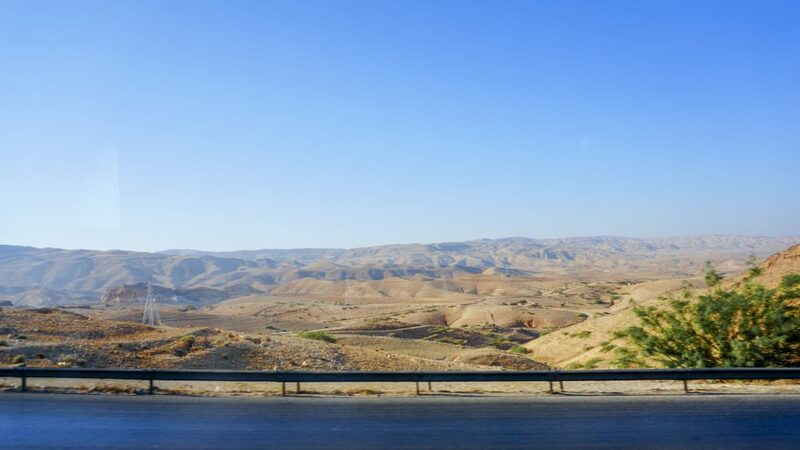 The Allenby/King Hussein Bridge (This is where we going), 57 km away from Amman, is located in the southern Jordan Valley. 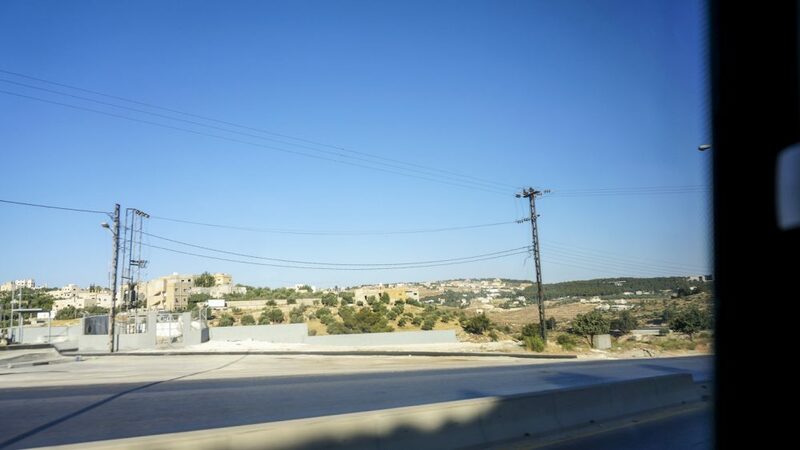 Sheikh Hussein crossing /North Border is 90 km away from Amman. It is located in the north, close to Lake Tiberias (Sea of Galilee). Wadi Araba Crossing/South Border, located in the south, 324 km away from Amman, connecting the two Red Sea resorts of Eilat and Aqaba. Mr. Mahdi said the trip will take about 40 minutes up to 1 hour to the border checkpoint depends on the road. I was really into the view on the road before I realize that I should take pictures. The feeling being in this desert country is a mix. There’s a lot of space like really spacious from one house to another, a lot of empty space. Many of the buildings are not even close to one another. A really contrast view to where I live. I love how the sun matches the view of this city. Almost every house I saw use the same bricks, yellow natural ancient feels. The guide said that it’s some sort of a government rule to use only that yellow bricks. It creates a general look for the city for the sake of beauty. And it works, it definitely is. Just look at those buildings, sands, desert, the sun and the blue sky blended in beautifully. Although the temperature could hit above 40 °C by day (I started to feel the heat), it was a peaceful moment to see the city itself. 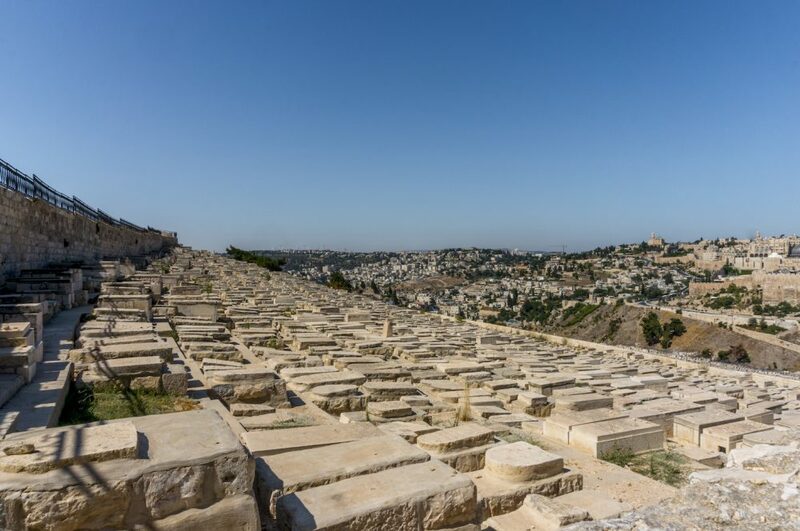 Jordan is a relatively small country with more than 9 million population, which almost half of them are in Amman. 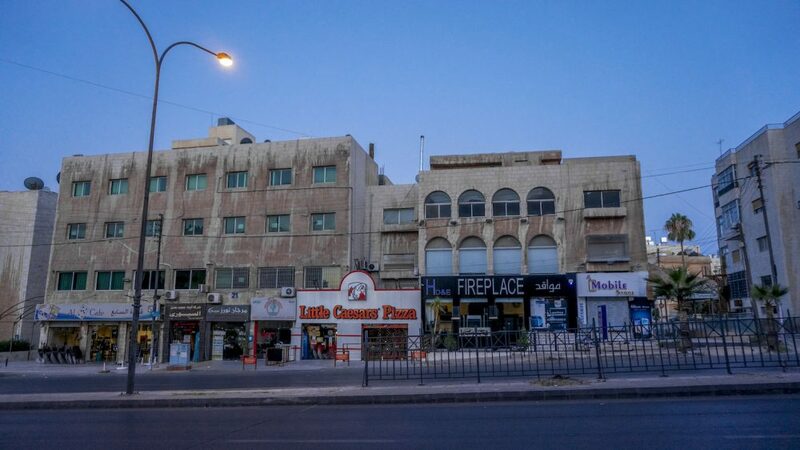 Nowadays, it is considered among the most liberal and westernized Arab cities, just as Jordan among the safest Arab countries in the middle east. Some facts that Mr. Mahdi told us pretty mind-blowing tho. Jordan is classified as a country of the upper-middle-income economy. Basically, they’re pretty rich. They diversify the economy sector very well. But the main categories are industrial (Dead Sea minerals) and tourism. Little did I know that their currency (Jordanian Dinar) is stronger than USD. 1 JD = 1,4 USD approximately. In busy hours, the road will be in heavy traffic. There’s no motorcycle at all as far as I can see all the way. He said the normal transportation for Amman citizens is a private car. Since they are landlocked, meaning no direct access to water sources, Jordan is struggling with water supply for its citizens. So they built dam and pipe for the water system, plus they kinda made an agreement with Israel for access to water from the Sea of Galilee. They rank the second poorest country in terms of water resources per capita. They have this water-quota kinda thing, which the government shares the water through the system with time and area quota. So they just had to have a water reservoir system in their home to reserve waters for daily use. It wasn’t long before we finally hit the border checkpoint, where our bus queue with other buses to pass the security gate. I cannot take pictures, no camera allowed. The border controls are pretty intense. 20 minutes, then we’re good to go. We’re heading to the border where we need to get off the bus and pass through the Israel immigration. Now, this is no joke. Getting into Israel is like no other immigration. Reading their history and knowing their stories, I think I understand why. They are super strict, it was intense and really not comfortable at all. 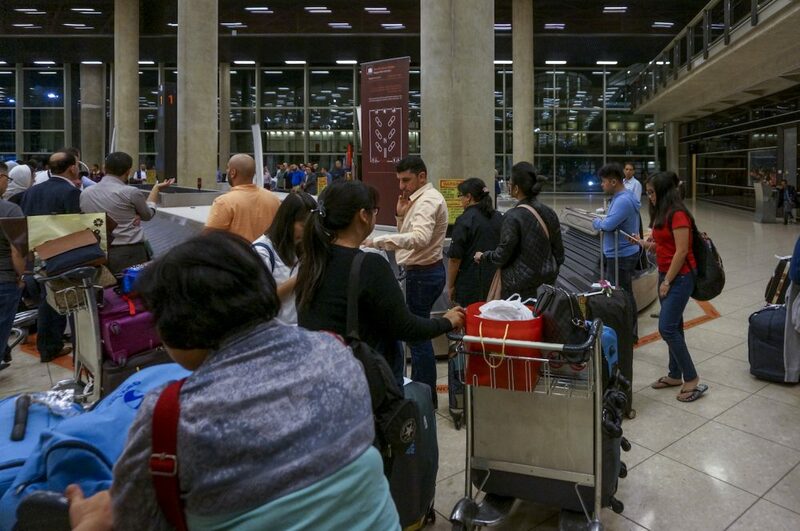 We even have to queue for more than 1 hour just to check in our baggage, before we finally will get through the security check for personal hand-carry items. We had troubles with some of our group members, where they got questioned with their belongings. I guess it’s kinda normal for a “random security check”. But then it’s really intense when they start to bring in some people inside a room with military officers here and there. Crossing border to Israel is no fun, no joke at all. It is intense for sure. Better be safe, just put everything inside your carry-on bag, and prepare yourself with random questions such as, “Where do you want to go in Israel?”, “What are you going to do there?”, “Where will you stay? How long?”, etc. There’s this one group of Arab people. I guess they were just going home from Mecca since they carried a lot of zam-zam water. They had a hard time with the immigration officers. Turns out one of the ladies who seems to be sick, I saw her hand bleeds underneath her long clothes, really disgusting. Took us more than 2 hours until everyone gets through the immigration, and finally, find our local Israeli guide, Mr. Dani. For you guys with many belongings, you can get a trolley just outside the building. Don’t they have a porter? Yes, they do. But, save your time and take care of your own belongings. We found the guide and the bus, quickly load our bags and off we go. Finally! We’re here in Israel. After such a hassle to cross the border. 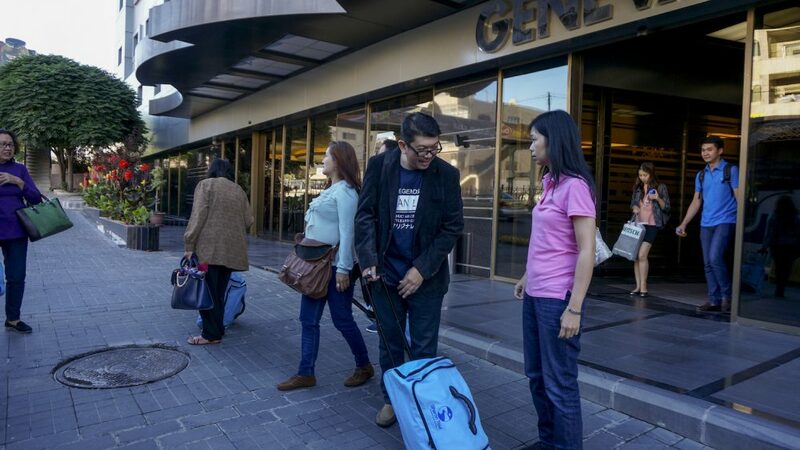 Book your stay in Jordan, or just stay at Geneva hotel and get the best deal.